" Women dedicated to a better Canada" is our National motto. IODE Margaret Stokes Chapter is a diverse group of women in a small Ontario town who like to have fun and at the same time help our local community. Our motto is "United for Service". The letters IODE stand for our historical roots, but our focus is on women dedicated to a better Canada. IODE supports projects for children, youth and those in need. We promote pride in our country, we support our troops, we provide scholarships and bursaries to students and awards to outstanding Canadians. Order from an IODE member or call 519-882- 1684. Deadline for orders is April 1, 2019.
for supporting our quilt show. Education Officer, Helen Danby, is honoured for her IODE involvement by Mayor Loosley. Ready for the Remembrance Day Parade 2018. Thank you to our Veterans..
At the Petrolia Legion, a luncheon was held for the veterans sponsored by the I.O.D.E Margaret Stokes Chapter. Two quilts were presented. Gunner, Sid McLean served with the Royal Canadian Artillery in WWII. He was 16 when he entered the service and trained as a “Commando” with the Black Watch. Sid’s quilt was made by Val Johnson and her Friends Who Care especially for a veteran. Carol Cote did the quilting. Master Warrant Officer (Retired) Dale Moore served 30 years in the Air Force . His training helped him with civilian work in the oil and gas industry for his second career. His quilt was made by the Cambridge Retreaters and quilted by Carol Cote. A big THANK YOU goes to the many hands that help make these presentations possible. You can see the joy on all of the faces of family and friends. Thanks to Ginny Williams and Dawn McNally for helping with the presentations. 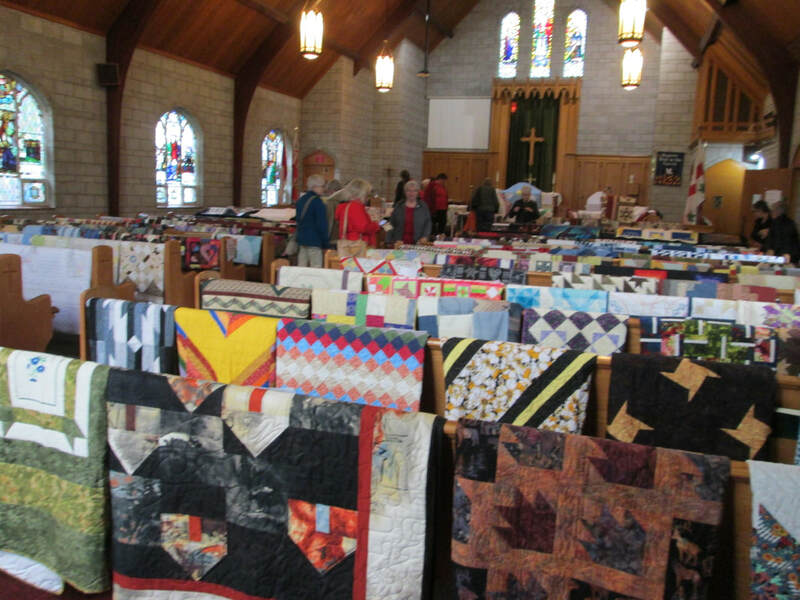 At both presentations, people mentioned that the quilts were so stunning and each one was different. 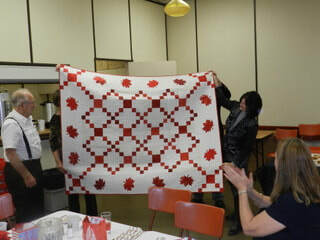 Special Thanks to Laverne Phills who was responsible for the donation of the "Quilts of Valour".